Burgess Hill Town head coach Simon Wormull says his side have ten cup finals before the play at the Amex in May. Wormull's men beat Mid Sussex rivals Haywards Heath Town 2-1 on a misty night at Culver Road thanks to a blistering start which saw them go 2-0 up inside 10 minutes. Heath did pull one back in the second half but the Hillians did enough to reach the showpiece final at Brighton and Hove Albion's ground in May. Wormull said: "To be honest with you, it’s good distraction from the league. "The league is high pressure at the moment. I said to the guys before the game, it’s a 3G pitch, you like playing on it, enjoy yourself and go and impose yourselves on it. "I thought we gave ourselves a great opportunity by getting the early goals. "It kind of steadied everyone because in recent weeks we have been a little bit nervous looking for that first goal.But once we got it I thought we were great. If we show that resilience against Dorking we will give them a tough game again. "The next 10 games are all cup finals leading up to the one at the Amex. It gives me a little bit of a carrot for those who want to play in that final now. "I need some consistency now. We need to get four or five wins as quick as we can so we can enjoy ourselves a little bit." 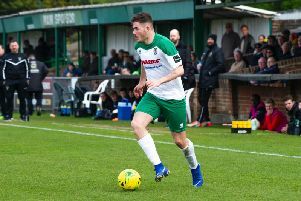 The Hillians will face either Bognor Regis Town or holders Brighton and Hove Albion u23s in the final and Womrull knows who he would like to face. He said: "I would like to play Bognor. We got a slapping at their place but at our place it was a really good close game, so it would be nice to get one over them." Assistant manager John Rattle was pleased with the way his side performed. He said: "I am delighted because we showed we can play football. "With respect to Haywards Heath there is a gap and I think when we play as we did in the first 30 minute, that gap was maybe a little bit too much for them to bridge. "We have got some good players and unfortunately. for them we are at the wrong end of the table at the moment. We have to live with it but we can get out of it. This is a great bonus for the supporters, the club, Kevin [Newell - chairman], he’s put so much time and effort into it, to have a day out at the Amex. "We have got to put this to bed and go again Saturday against Dorking. "If you look at our record as a football club we play very well on 3G. We didn't think they could handle our guys with pace. We have brought in guys from Bromley and Woking, conference sides, and they like playing on these surfaces. "They [Haywards Heath] play a certain way and they didn’t surprise us."